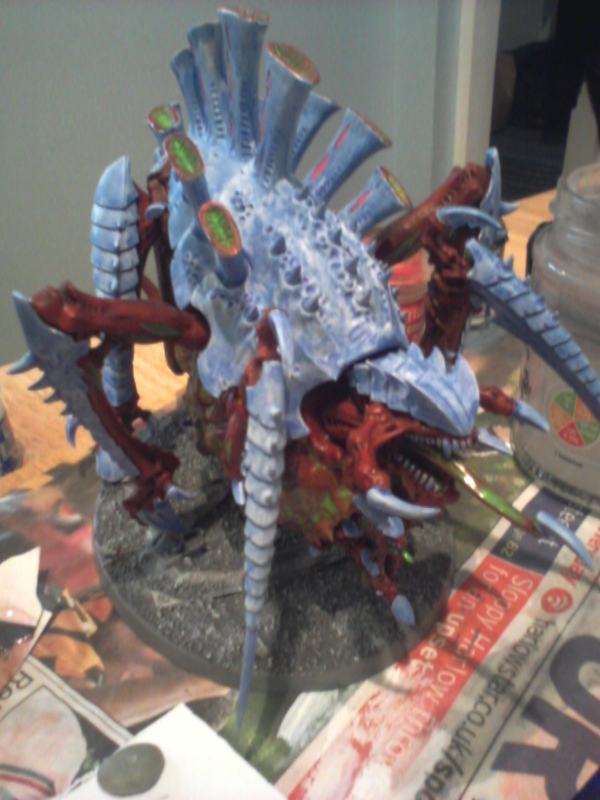 In random painting news, I've finally finished painting my Tervigon. This is particularly significant, as it was a Birthday present from my darling wife, so I have to show that I appreciate it rather than just letting it join the forlorn pile of half finished, unpainted junk gradually accumulating beneath the bed. Here's a blurry camera-phone shot of the finished article for your amusement. Thankfully the blur hides the painting flaws. Moving swiftly on; I have come across a certain painting event known as Dreadtober. The gist of this is that the participants must build and paint a Dreadnought before the end of October. Sadly, I don't have a Dreadnought to hand, but I do have four spare Carnifexes! Using the old, Space-Crusade definition of a Dreadnought, I'm sure a Carnifex could be squeezed into this category (despite Greg's protestations). So, before the end of the month, I will produce at least one fully painted (tie-dyed) Carnifex. Updates and complaints about lack of progress to follow. Challenge accepted! I'll take some photos tonight, check the blog tomorrow.